Shinjuku is an urban centre around the Shinjuku station in west Tokyo. It consists of an eastern part focused mostly on entertainment and shopping and a western part with a skyscraper district with some very impressive architecture. 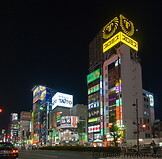 Shown in this gallery is the eastern part of Shinjuku which is full of entertainment centres, restaurants and shops.